Just two mines supply the United States with half of its silver production, and both are located in Alaska. It's quite amazing that Alaska now produces half of the silver for the U.S. when only 30 years ago total mine supply from the state was less than 50,000 oz per year. The silver produced in Alaska comes from the Greens Creek and Red Dog Mines. One is a primary silver mine and the other a zinc-lead base metal mine. Even though Hecla's Greens Creek Mine is labeled as a primary silver mine, 56% of its revenues come from its gold, zinc, and lead metal sales. However, Teck Resources, that runs the Red Dog Mine doesn't even list its silver production in its financial reports. Because Red Dog produces one heck of a lot of zinc and lead, their silver production doesn't amount to much in the way of revenues. For example, the Red Dog Mine produced 542,000 metric tons (1.1 billion pounds) of zinc and 110,000 metric tons (222 million pounds) of lead, while its estimated silver production was 6.6 million oz (Moz). According to Teck's 2017 Annual Report, total revenues from the Red Dog Mine were $1.75 billion. With the estimated silver price of $17 in 2017, total revenues from 6.6 Moz of silver were $112 million, or just 6% of the total. In addition, Hecla's Greens Creek Mine in Alaska produced 8.4 Moz of silver this year, down from 9.2 Moz in 2016. As I mentioned, the Greens Creek Mine also generated a lot of gold, zinc, and lead, equaling $182 million of the total revenues of $326 million (including treatment costs). While Greens Creek and Red Dog supplied nearly half of U.S. silver production last year, the next two largest mines provided 21% of the total. Coeur's Rochester Mine in Nevada produced 4.7 Moz of silver while the Bingham Canyon Mine, the country's largest copper mine, supplied 2.2 Moz. Almost 7 Moz of silver came from these two mines alone. 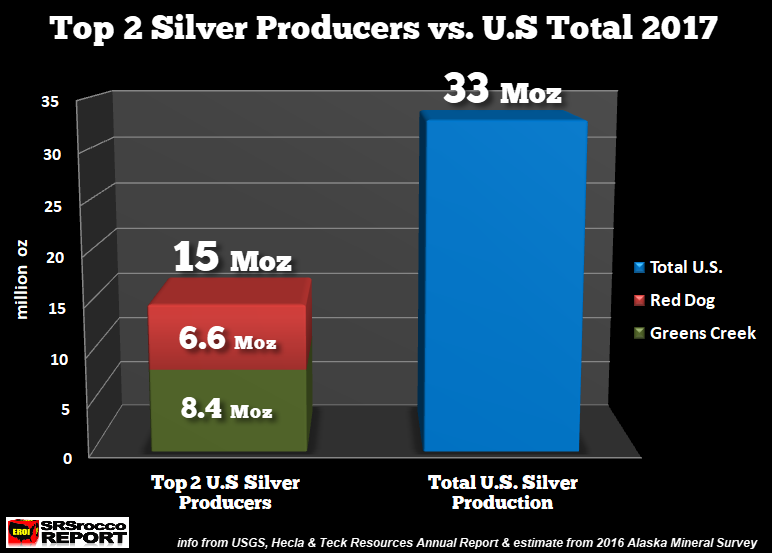 What's The Real Cost To Produce Primary Silver? Unfortunately, there are still investors who believe that it only costs $5 an ounce to produce silver. And who can blame them when Hecla comes out and reports that its AISC - All-In Sustaining Cost for its Greens Creek Mine was $5.76. If Hecla's Greens Creek Mine was profitable at $5.76 an ounce, then why did the company state a $23 million net income loss for the year? Well, part of the reason for the net income loss was due to costs associated with the suspension of its the Lucky Friday Mine as well as losses on derivative contracts. We arrive at a positive Free Cash Flow by subtracting the Additions of properties, plant, and equipment (CAPEX spending) from the Net cash provided by operating activities ($116 million - $98 million). If we take that $18 million and divide it by the 12.5 Moz of total silver production, then Hecla made about $1.44 of free cash flow per ounce. Hecla's realized silver price in 2017 was $17.23. So, if we subtract the $1.44 cost per oz from $17.23, then Hecla's estimated silver breakeven is about $15.80 an ounce. The reason Hecla can report such a low AISC is by deducting their gold and base metal revenue, which is labeled as "By-product Credits." The Greens Creek Mine had $182 million in gold, zinc and lead credits. By gosh, it's no wonder Hecla is reporting such a low AISC because it deducted 56% of its revenues. By adding up all the by-product credits from the three silver mines, it would equal $228 million. However, if we deduct the treatment costs of $48 million from that total, it turns out to be $180 million. Now, let's put our THINKING CAPS on for a minute. How would the removal of $180 million from Hecla's Net Income and Free Cash impact their financials? Way too many investors fall for this nonsense and do not understand that CASH COSTS and AISC are totally useless in determining the profitability of a company. Another thing I hear all the time from less sophisticated investors is that these mining companies use a lot of WRITE-OFFS, such as Depreciation, Depletion, and Amortization to show higher costs. Investors who believe these mining companies are making up deductions so they can show less profit, don't understand the accounting industry. If we add up the total Depreciation, Depletion, and Amortization (D,D & A) from 2015-2017, it totals $352 million. 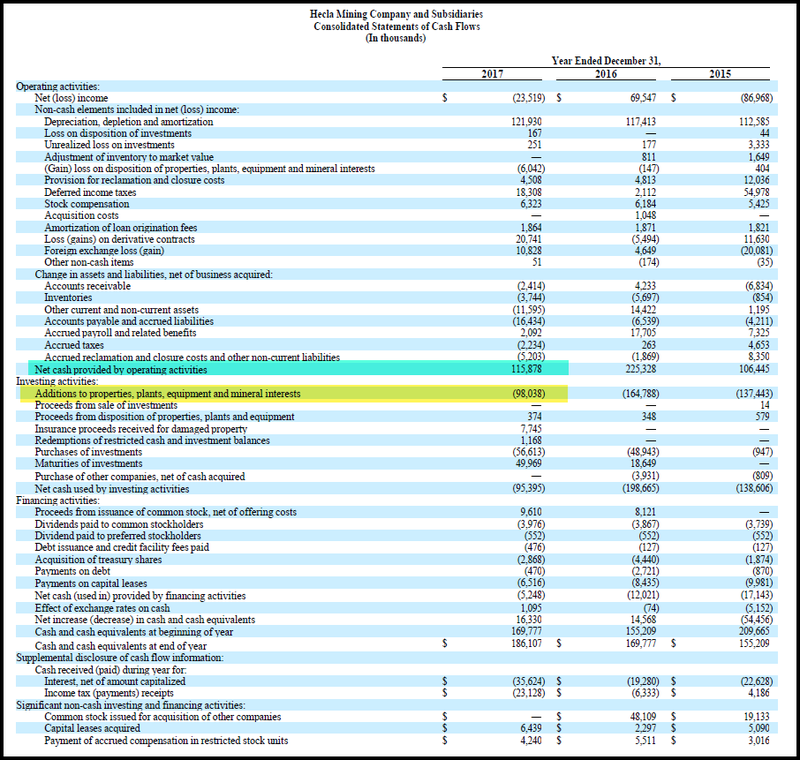 Thus, unsophisticated investors might think Hecla has made $352 million in profit because they are just writing off D,D & A to show more costs. Well, if we add up the CAPEX spending highlighted in yellow, Hecla spent $400 million on mostly sustaining and replacing production. Which also means, Hecla's net free cash flow for 2015-2017 was a negative $48 million ($400 - $352). 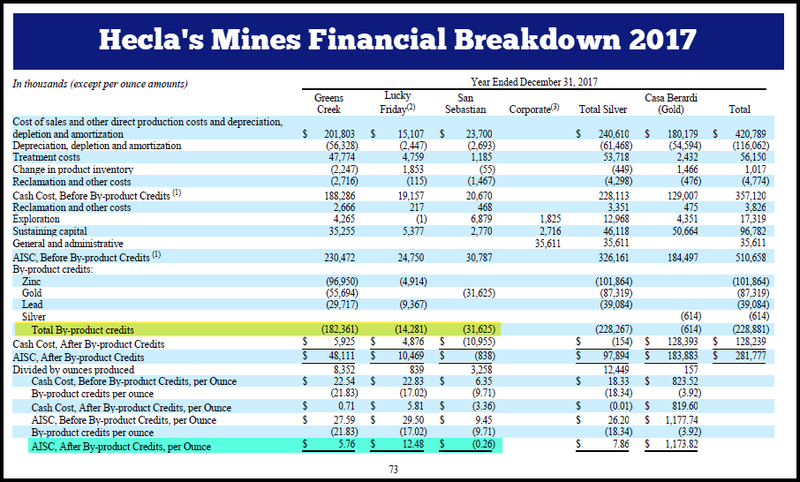 By investigating Hecla's financial statements, and doing some forensic analysis, we can plainly see that primary silver mining companies are not producing silver anywhere near $5 an ounce. If you have read this article and still believe the primary silver mining industry is producing silver at $5 an ounce, then you need to sell all your precious metals and buy Netflix and Amazon stock, hand over fist. PLEASE STOP looking at the markets on a DAY TO DAY BASIS... it will drive you bananas. The trends that I forecasted will take place over the next 1-2 years. As I mentioned in my videos, it took nearly two years for the Dow Jones Index to fall 53% from its high in July 2007 to its low in Feb 2009. Nothing goes down in a straight line... especially BITCOIN and the CRYPTOS. So, be patient. The fundamentals for STOCKS, BONDS, & REAL ESTATE are just as lousy today as they were in January when the market peaked. Give it some time and don't sweat the small stuff. One more thing... individuals who believe the Precious Metals Dealers are the shills and swindlers pushing worthless gold and silver, please get your head examined. I hate to be so blunt, but it does seem like IQ's have dropped considerably over the past few years. I would kindly like to remind these Fiat Money Einsteins that there is no intrinsic value in paper money unless you want to burn it or use it to wipe one's bottom. However, gold and silver can be used in jewelry and industry. If you take your gold jewelry to a pawnshop, you are very likely to receive a significant percentage of the spot price (minus recycling costs, etc). Now, go to Venezuela and see how much the INTRINSIC VALUE is for the Bolivar. At best, the intrinsic value of a Federal Reserve Note is its printing cost. Currently, it cost about $0.14 to produce a $100 bill.